The Latest from the snow desk. I'm right in the inbetween zone. So far we are getting slammed by snow in Quebec City but there was an ice rain warning on the radio earlier this morning when I drove to work. 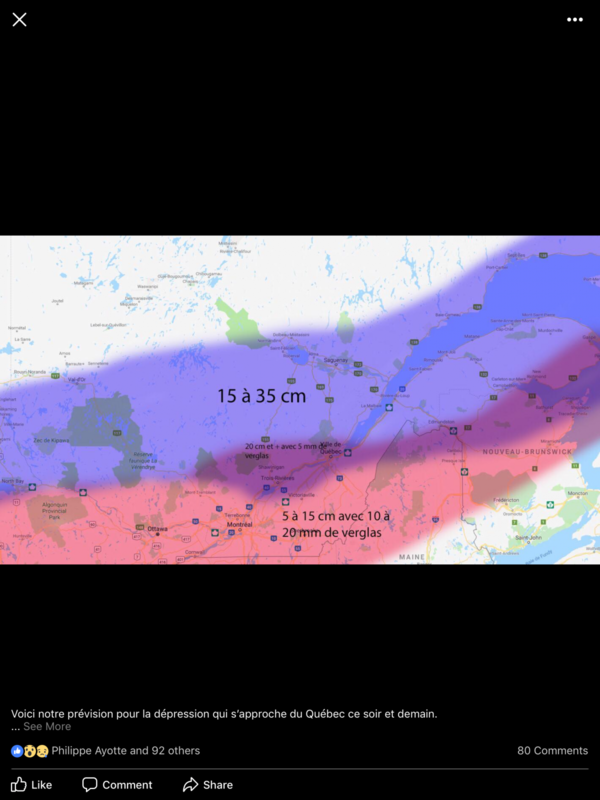 Northern Quebec and the top half of Gaspe looks like they are going to get a nice snowfall. Freezing rain in Quebec City since about an hour or two. Started snowing here in the Tremblant area around supper time, got about 5-6 inches before turning to freezing rain. Freezing rain/rain today but so far the thick ice crust on the new snow is protecting it. What the frig is with this winter, we just get going nicely trail wise, then crap weather just about destroyed it, we start to recover and bam, more crap weather. But was also drizzeling there most of the day and should turn back to a little more snow tonight. Mmm... best steak frites in QC!